Each dog and handler follow world recognised standards. They locate and indicate all live people in many sites and situations such as vehicles, ships, aircraft, transport depots and hubs such as bus stations and airports. At times of natural disaster, human smuggling detection dogs assist the relief efforts. War-torn buildings present unstable locations for humans but can be quickly traversed by human detection dogs. Handlers can instruct dogs to locate and help recover live casualties from every situation and circumstance. 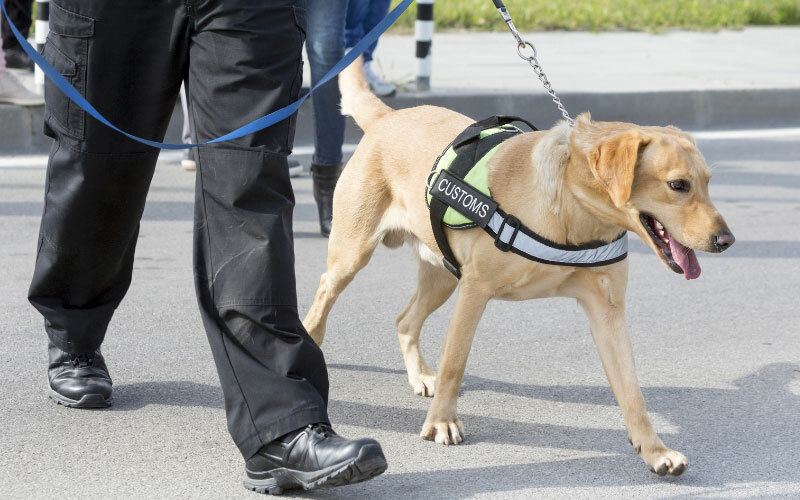 Everyone involved in aid work understands the skills of the human detection dogs. Concrete surfaces or dense vegetation are no barrier to human detection dogs. Search and rescue can be in amongst shipping containers or across open fields. These dogs are trained to pick up the scent of where humans are thought to be. They track down the location and lead the handler to the exact spot. Human Detection Dogs from SpecialistK9 undergo training using the latest methods and techniques – techniques that have a proven track record of success. Human Smuggling Detection Dogs are now commonplace at airports, shipping docks and other transport hubs. We welcome all enquiries from organisations that operate such facilities. We also welcome questions from organisations helping with relief efforts at locations around the world. Discuss and assess your requirements with SpecialistK9. Get the appropriate Human Detection Dogs for your needs. Contact us via telephone, email or using the online contact form on this website. Need Dog Detection Services? Contact Specialist K9 Today! Specialists in all aspects of dog detection services across the UK and Europe. From routine drug inspections to human trafficking detection services. To contact us, simply call us, email us or fill in our contact form. Note: Mobile dog patrols only available in Yorkshire.